Longtime readers of this website may remember that when it launched a decade ago, Jalopnik announced itself to the world as a place that loved cars sometimes “just because of the curve of a hood.” And in a nod to compelling hood curvatures—as well as the site’s “exclusive sponsor” at the time—its logo contained the Audi RSQ concept from I, Robot. Until I went and checked again recently, I spent the longest time thinking that car was actually an Audi TT instead. If there was ever a car I found beautiful just because of the curve of a hood, it was that one. I’ve always been a fan of the TT, especially the original, if only for its looks. Never mind the TT’s humble Volkswagen Golf platform underpinnings, or performance that never quite put it in the top tier with other sports cars. It always won me over in the end with that timeless Bauhaus-inspired design. Each generation of TT was on the market for a relatively a long time—eight years apiece. Now it’s back for a third iteration and all-new this year, based once again on a Golf platform. This time it’s the fantastic MQB platform that also serves the Audi S3 and Volkswagen GTI, among others. It’s faster and more high-tech than ever. But in many ways, it’s very much the same, and that means this TT is still more show than go. Let’s get this out of the way first. I think the new TT is a supremely good-looking car. Like all of you, I was perplexed when it debuted, barely able to tell the difference between this one and the old car. I can now, and while it’s admittedly very similar, don’t care anymore. The TT is very much one of those cars that looks better in person, and after seeing one in my garage for a week—in my favorite color, no less—I’m a bit smitten. Gorgeous lines, a relatively compact body, a more aggressive face than past TTs, a nice clean profile, and compelling curves front and back and on the rear arches. It’s a win for geometry. Are we over the design now? Okay, good. Because that remains the best thing about the TT. The rest of it, including and most notably the way it drives, is good, but certainly not in any way that won me over in a week of testing. 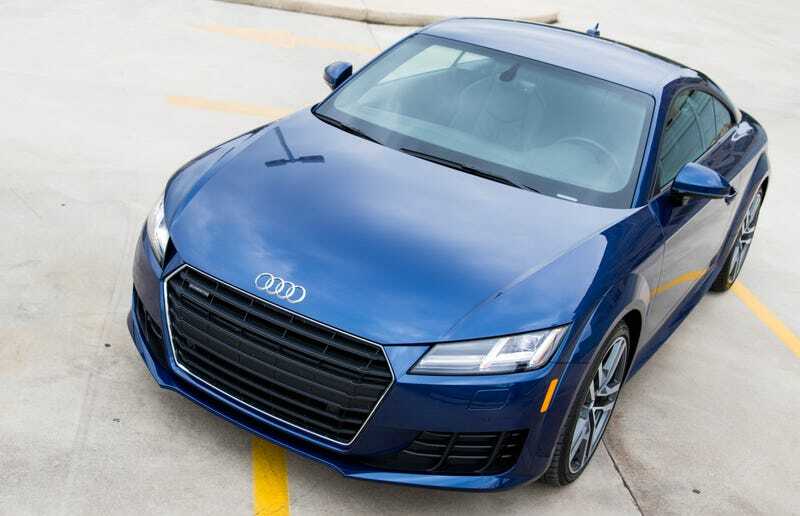 In the U.S., the TT coupe comes in just one setup: quattro all-wheel drive with a six-speed DSG and the VW Group’s ubiquitous but outstanding 2.0-liter turbo four-cylinder engine. That motor packs 220 horsepower or 292 horsepower in TT S trim; you’re reading about the former. There’s a nice engine note, too, but it very obviously comes into the cabin by way of Bang & Olufsen rather than an exhaust pipe. I also have to bring up its 155 mph top speed. No, I didn’t try to get it up that high; Texas may not be Virginia, but I didn’t feel like pressing my luck. What impressed me was how comfortably this thing will do, well, speeds that are more acceptable in Germany than they are here. Despite being small and light, the TT will do 80+ on a Texas toll road as effortlessly as an A6 or an A8. Let’s talk about what goes on inside the cabin. The 2016 TT is notable for being one of the first new Audis with the Virtual Cockpit, the driver-centric combined instrument cluster and infotainment system. In short, it works and it works well. There’s an assortment of menus you can scroll through, from maps to car diagnostics, and the digital speed and tach gauges can shrink or take up more screen space at the touch of the View button on the steering wheel. Speaking of that screen, it alone is a work of art, probably the best digital display I’ve used on any car to date. Having all the functions directly in front of the driver is an interesting change, but I found it to be better for keeping my eyes on the road during navigation. Controls for this are still off to the driver’s right (or left if you’re reading this over high tea and biscuits), which takes some getting used to, but overall Virtual Cockpit is a win. I can’t say the same for the turbine fan-shaped A/C controls, which felt cheap and kind of confusing to operate. The rest of the cabin is tasteful, modern and clean, if perhaps even a bit too understated. I was genuinely impressed with the steering wheel; it contains a huge array of controls in a really thin, conservative package. Unquestionably, the TT is a solid handler with a ton of grip and light, accurate steering, though VW’s racks of late have been more devoid of feel than I like. It’ll stick hard in the corners and go wherever you point it with urgency. People rag on the TT for being “just a Golf,” but it’s more like a GTI or a Golf R loaded with aluminum to keep it light, so it’s way better than it gets credit for. And yet, lovely design aside, it’s just not what I’m after in a sports car. When Mike first drove the new TT, he called it Your Parents’ Perfect My First Sports Car. I thought that was a bit harsh at first, but after driving the car I realized it’s spot-on accurate. You really can’t get into trouble driving a TT, and that’s what is missing most from its driving experience. It’s one thing to have a hot hatchback or an AWD sport sedan that’s as poised, unflappable and smooth as the TT. But for a sports car, a car designed for sporting, I expect a bit more of an edge. I want to be able to get into a little trouble. When I put the TT on some back roads, I wanted to be able to get the rear end out. And as good as the six-speed DSG is—it’s one of the best automatic gearboxes on the planet—I’d at least like the option of rowing my own gears, like you used to be able to do on a TT. When I drove the TT on fun roads, I just couldn’t shake the feeling that I’d rather be in the new Mustang GT or Mazda Miata instead. One’s much heavier and the other is much less powerful, but both are cheaper and considerably more fun. Better yet, since this TT came in at $50,600, I’d much rather be in a BMW M235i for pretty much the same price, or less. Then you’d get two more cylinders, a lot more power and speed, a manual if you want it, and all the tail-out antics you want. And now, it even has optional AWD if you need that as well. You could spend more on the TT S, but is it worth it? The experience I most enjoyed with the new TT was staring at it in my garage. I just wish the drive offered a little more.